This article first appeared in The Edge Malaysia Weekly, on September 11, 2017 - September 17, 2017. THE Iclif Leadership and Governance Centre is getting people to rethink their definition of leadership. The non-profit organisation, which focuses on leadership development and corporate governance, and is funded by Bank Negara Malaysia, believes that leadership is all about energy. It has an unconventional definition of leadership — the art of harnessing human energy to create a better future. “The difference between leaders and non-leaders is that the former find the energy to stay on and fight, and energise others around them while the latter give up … Leadership energy has to be discovered; it cannot be taught in a classroom,” Iclif CEO and lead faculty Rajeev Peshawaria told participants in the Leading Leaders Programme that was held in Bangkok recently. 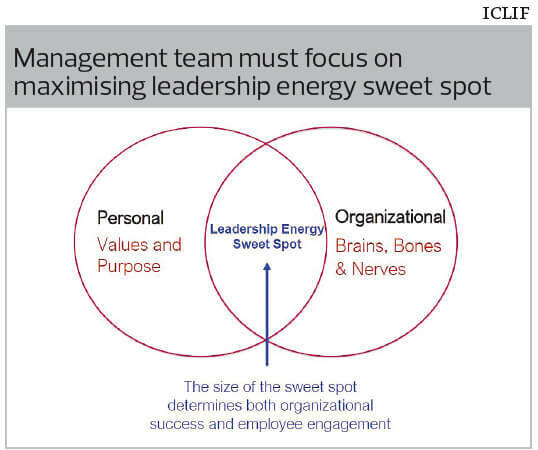 Organisational success and employee engagement are determined by the size of the leadership energy sweet spot between personal and organisational energy, he said, adding that the larger the overlap between the two components, the higher the potential for sustainable organisational growth and success. The week-long programme, which ended on Aug 25, challenged participants to rethink their conventional views of leadership, find their personal leadership energy and look at energising their organisation. Rajeev believes that to energise their organisation, leaders have to move from creating results individually to creating conditions for collective success. And to do so, they need to look at three important pillars of sustainable business growth, which, in his words, are the brains, the bones and the nerves of the framework. The brains refer to the vision, mission and strategy of a business; the bones are the people, processes and structure; and the nerves represent the culture and values of an organisation. “Research has shown that the brains, bones and nerves need to be managed 80% to 90% of the time to create sustainable growth. But most of the time, once these are in place, management gets busy with firefighting and the running of day-to-day business, and don’t actively think about the brains, bones and nerves,” observed Rajeev. Touching on the brains of an organisation, he emphasised that part of forming a compelling vision and establishing strategies is to address the “what, who, how and why”. “What do we want to be? Who are our stakeholders? How will we get there? Why will we succeed?” he explained. But management has to take it a step further, that is, it needs to articulate the vision and strategy in a simple manner so that everyone understands and accepts them. Rajeev pointed out that more often than not, it is not that management does not know how to come up with good strategies. Rather, the problem lies in communicating the company’s strategies effectively. As for the bones of an organisation, which are essential to achieve its objectives, what happens most of the time is that the processes are misaligned with the goals, Rajeev said. “For example, companies hope for teamwork but they reward individual effort.” He stressed the need for management to identify the processes that are in conflict with the company’s expectations. On the third pillar of sustainable growth — culture and values — Rajeev said the desired culture can be created by first articulating the company’s identity through core values, then socialising the core values through clear communication, feedback, coaching and the leaders walking the talk. The final step is reinforcing the desired behaviour by aligning key processes with the core values through performance evaluation, compensation, promotion and rewards. However, the process of creating a culture of ownership and high-performers presents a different challenge in the rapidly changing economic environment that we live in today. 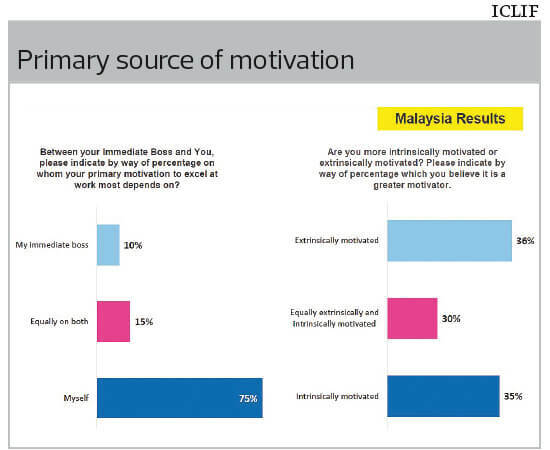 According to Rajeev, global surveys and research done by Iclif show that a large percentage of employees are intrinsically motivated and admit that their primary motivation to excel is dependent on “self” rather than their bosses. As intrinsic factors are important, managers need to better understand those that drive each employee. Unconventionally, Rajeev urged managers to give employees minimum rather than stretch goals. He also suggested that managers allow employees to self-manage performance quantity and quality. “We know that the 20:80 rule is where 20% of employees will be top performers while the remaining 80% will be average or below average. So, instead of thinking about how to motivate them, let the employees decide for themselves where on the performance bell curve they want to be and reward their performance accordingly,” he explained. Rajeev pointed out that the primary sources of limitless personal energy came from clearly identifying one’s values and purpose. It is only when one is crystal clear about his values, being the moral principle that one deeply believes in and lives by, that he can have this “fearless purpose” for the better future that he wants to create. Rajeev cited as examples famous leaders like Mahatma Gandhi, Howard Schultz and Soichiro Honda, who were very clear about their values and purpose in life and relentlessly pursued these to create a better future despite great resistance. “Being clear about your values is not as simple as you think. There are many people who live life without thinking about their values and purpose. That is not okay. You have to be 100% honest with yourself about your wants and desires in life; this is called emotional integrity. “There is no right or wrong, there’s only true or false. So, what is true for you is right for you. It is important to take the first step towards discovering your values and purpose,” he said.